St. LOUIS (ResourceInvestor.com) -- Freeport-McMoRan, the world's largest publicly traded copper and gold company, took advantage of rising copper and gold prices and increased copper production to more than double its third quarter profit - despite an impending drop in output in the fourth quarter. Freeport [NYSE:FCX] posted a profit of $775 million, or $1.87 per share, in the quarter ended 30 September, compared to $351 million, or $1.67 per share, a year ago. Earnings per share would have been $2.52 - higher than analysts' expectations of $2.26 - but Freeport said the results included one-time charges of about 67 cents per share. Those charges included accounting costs and losses from debt reduction. Freeport's acquisition of Phelps Dodge - announced in the third quarter of last year and finalized in March 2007 - boosted the company's copper reserves to 94 billion pounds, up from 2006's reserves of 54.8 billion pounds. Resources have the potential to be in the upwards of 146 billion pounds. The Phoenix-based miner benefited from rising copper prices in the third quarter, which averaged about $3.53 per pound compared to $3.43 last year. The company's copper sales rose to 949 million pounds from 324 million pounds year-on-year. 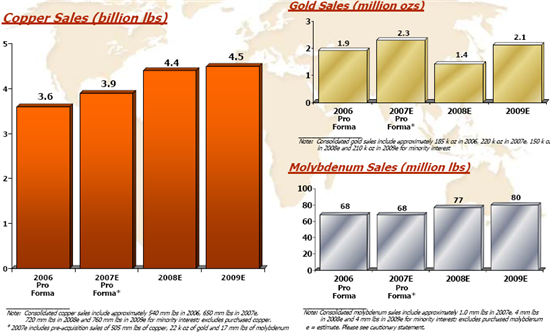 The average gold sales price rose too, from $608.57 per ounce last year to $692.43. But Freeport's gold sales fell by 44% year-on-year, from 478,000 ounces to 269,000 ounces - and a bigger drop to 100,000 ounces is expected in the fourth quarter. Copper sales are also expected to drop in the fourth quarter to 875 million pounds. Freeport, which has operations in the U.S., Chile, Peru and Indonesia, blames its Grasberg complex in Indonesia for the drop in output, saying it has hit a low-grade area in the mine. Grasberg contains the largest single copper reserve and the largest single gold reserve worldwide, according to Freeport's website. The firm mines a 24,700-acre section of the complex and is conducting exploration on another 500,000-acre area. Chief Executive Richard Adkerson said investors can expect 2008 output to be lower as well - and costs will be higher. "We're in a low-grade section of the Grasberg mine," Adkerson said in a conference call. "We're looking to have approximately the same copper volumes, maybe a hundred million pounds more, but our gold volumes are going to be down substantially, from over 2 million ounces to 1.4 million ounces." "So you're going to see, depending on the gold price, our unit cost being higher.... We're fighting them every day. And these unit costs numbers are just going to move around, depending on the volumes." Net unit cash costs at Grasberg rose 46% in the third quarter year-on-year, from 70 cents to $1.30 per pound of copper, while production fell from 308 million pounds of copper to 177 million pounds and from 449,000 ounces of gold to 182,000 ounces. Freeport says the higher net unit cash costs in 2007's third quarter reflect the lower output volumes and rising metals prices. "Because the majority of (Freeport's) costs are fixed, unit costs vary with the volumes sold and the price of gold, and therefore are currently projected to be significantly higher during the second half of 2007 than the average net cash credits of $0.25 per pound in the first half of the year," according to a Freeport press release. Freeport's molybdenum production was up from 16 million pounds in the third quarter of 2006 to 18 million pounds this quarter. Sales were down, however, from 19 million pounds last year to 18 million pounds, at prices of $22.59 and $27.89 respectively. Much of Freeport's revenue growth can be attributed to its for $25.9 billion in March. Freeport sold its international wire and cable business, Phelps Dodge International Corporation, for $735 million in September. Freeport said the deal will close in the fourth quarter, and it will use the expected net proceeds of approximately $620 million to repay debt. Freeport's shares added 69 cents to trade at $118.84 on the New York Stock Exchange today. Copper is experiencing a bit of a correction as of late, with prices dropping from a 30-day high of $3.7567 per pound to trade at $3.5072 today. It is still trading higher than the year-long average, but increased London Metals Exchange stocks could hold the price steady or send it down. "Overall the metals are finding some underlying support, but seem in no hurry to rally with profit taking capping any advance," said today's BaseMetals.com report. "In the absence of metals-specific news it looks like equity movements and LME stocks will set the direction." Thanks to swings in the dollar, gold has been rocking back and forth around 28-year highs recently. Many analysts are predicting a major correction in the near future before gold sets off on another upswing. "The lack of significant pullbacks in gold has kept raising the risk of larger magnitude ones for the past three weeks. The market was seen as trading some $80 above its 200-day moving average and at least $40 above the 50-day one," Jon Nadler of Kitco Bullion Dealers said in a note. After a healthy correction, look for gold to hit $800 and beyond in the next year.